Quick Glance of this razor pocket mod kids scooter reviews? 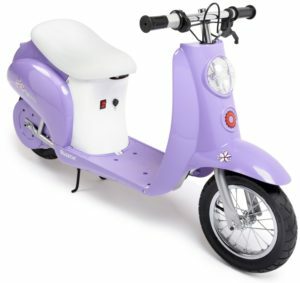 Comfortable and quiet electric scooter, Designed for kids aged 12+ . Though consumers have mentioned even their 8+ kids enjoyed it. I’ve talked about this below, at the last part. Features 12-inch pneumatic tires, a padded seat and a rear suspension system to ensure comfort. Good hand operated the rear braking system, has the storage compartment under seat. 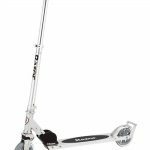 The Razor Pocket Mod Miniature Euro Electric Scooter is a battery-powered chain-driven electric motor operated scooter that offers high-performance along with a vintage-inspired body. The scooter is powerful, can go up to 15 mph and is designed for kids of 12 and more. It also features a pair of 12-inch pneumatic tires along with a rear suspension system to ensure a comfortable and enjoyable ride. The scooter is tough and able to handle user of 170 lbs max. It also comes with various color options. A very quiet electric motor driven scooter will make almost no sound while riding. 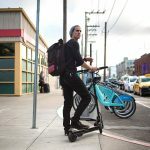 Variable-speed, a chain-driven powerful electric motor for maximum power transfer, can speed up to 15 mph, which is fast enough to have fun or a quick trip to the corner store for a 13 year or more old kid, not enough to get an accident. A comfortable electric scooter with 12-inch pneumatic tires, rear suspension, and a padded seat. Two good quality 12V( 24V combined power) batteries, can go up to 10 miles with a single charge. A good hand-operated rear braking system ensuring safety. Some useful features like Twist-grip acceleration control, Retractable center-mount kickstand and storage compartment under the seat. A good enough length of warranty for an electric scooter, making you tension free for first use. Razor pocket mod has got a great feedback from consumers. Consumers reported it was well-built and comfortable fun machine for there kids. To mention, many of the consumers have reported that they bought it for their 7-10 year kid also, though the minimum recommended age was 12. But surprisingly, they had no issue whatever. They’ve said that even their 8 or 9-year kid enjoyed it much and could ride it safely. So, I would say it’s a go even for a 8+ year old kid.